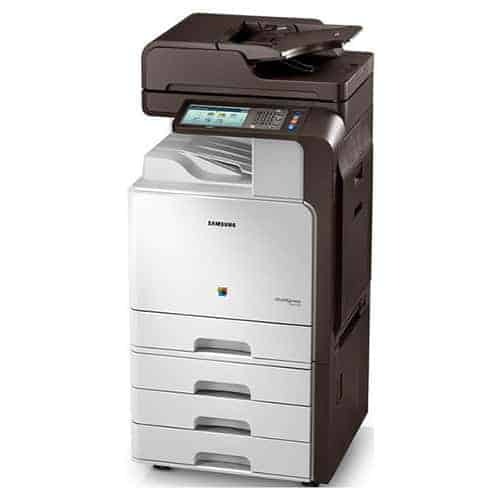 Samsung CLX-8650ND Color Multifunction - Perfecta Business Services, Inc. In today’s fast-paced environment, it is essential to achieve maximum uptime while delivering outstanding quality. Samsung’s award-winning CLX-8650ND/XAA 51 ppm color multifunction printer provides the performance businesses need to realize an efficient output of documents and streamlined workflow. All while producing vibrant, high-quality color printouts with unique rendering technology. For maximum control and visibility, the CLX-8650ND features a 7” Samsung color touch panel with smooth response to flicking and scrolling. Thanks to the intuitive, smart User Interface, you can manage and control even the most complex jobs quickly and easily.